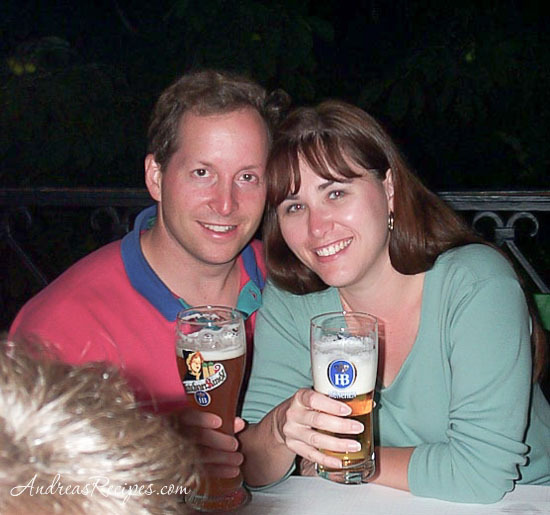 Ten years ago Michael and I made a trek to Germany for our honeymoon. We travelled around the country with a tour group—not exactly romantic for a honeymoon, especially since we couldn’t convince the strict tour guide to get us hotel rooms with a double bed instead of two singles—but we had a great time visiting the cities and sampling the terrific wines, beers, and food. 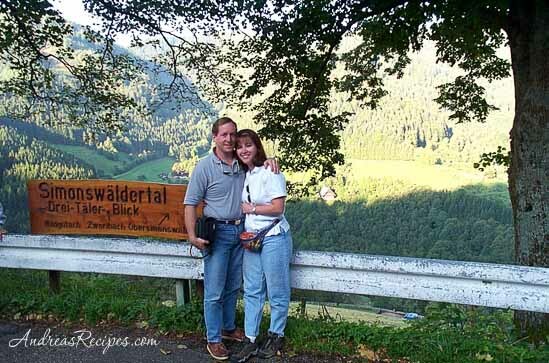 We chose an itinerary that would get us to Munich in time for the opening day of Oktoberfest, which we thought would be fun for our honeymoon since the 16-day festival started in 1810 as a wedding celebration. Much to the chagrin of our tour guide, who emphatically told us we would die if we dared venture near the Oktoberfest grounds, we skipped out on most of the scheduled tour itinerary and set off to see the city and festival for ourselves. Since I had been to Munich on a previous trip, I led some of the other travelers in our group on a night tour of the Marienplatz and Karlspatz area and then we went to the Hofbräu Haus for beer. The next morning Michael and I headed out to experience the opening day of Oktoberfest for ourselves. We didn’t die (obviously), and actually we heard the first day or two of the festival are pretty tame compared to the later days. The beer tents are huge and amazing, filled to the brim with people singing and dancing on the floor and the tables. Each beer company has its own tent with a band loudly playing German music, and there are food tents as well with roasted duck and chicken, cheese, and baked goods. Outside the tents there are carnival rides and games and food vendors with wursts, pretzels as big as your head, and many other things. We walked around in the rain and just took it all in, loving every minute of it, and thankful that we got to experience it together. Each year we celebrate our anniversary with some good German food, beer, and wine to commemorate our honeymoon. This year is our 10th wedding anniversary as well as the 200th anniversary of Oktoberfest, which starts on September 17 with horse races and runs through October 4. We will certainly celebrate for the next few weeks, and I will share a few more German recipes with you throughout Oktoberfest. We’ve had some amazing experiences during our first 10 years of married life, and we look forward to many more. I had my first taste of traditional cheese spaetzle (kaesespaetzle, käsespätzle) on a trip to Germany in the mid 90s, and it was easy to fall in love with this German comfort food. The simple flour and egg noodles are made by scraping a thick batter across a small wooden board or grater, or pressed through a spätzle schwob, a device similar to a potato ricer, then dropped into hot water to cook for a couple minutes. The cooked noodles are served with just a dollop of butter or are tossed with sautéed onions and Emmentaler cheese, or even layered with the onions and cheese and baked. We don’t have a spaetzle board, but I’ve made them with both a potato ricer as well as a grater type of spätzle maker. Of the two I prefer the ricer for the shape of noodles, but both work well. My recipe varies slightly from the traditional in that I brown the butter and cook the onions until they start to caramelize, which complements the richness of the cheese. German noodles with cheese and onions, a favorite comfort food. In the small bowl, whisk together the flour, nutmeg, salt and pepper. Beat eggs in the medium bowl, and alternately add the milk and flour, stirring until smooth. Let the batter stand for 30 minutes. While the batter rests, melt the butter in the large skillet over medium-high heat until it starts to brown. Add the onion and cook until it begins to caramelize, about 10 to 15 minutes. Bring the 4-quart pot of lightly salted water to a boil. Press the batter through a spaetzle press into the water. When the spaetzle has floated to the top of the water, remove it to a bowl, draining well. Mix in 1 cup of the cheese. Add the cooked spaetzle to the butter and onions and stir well. Add the remaining cheese, stir, and serve hot. Baked Spaetzle – Preheat the oven to 375° F/190° C. Lightly grease a 2-quart baking dish. Spread half the spaetzle on the bottom of the dish and top with half the cheese and onions. Repeat with the remaining spaetzle, cheese, and onions. Bake until bubbly, about 15 minutes. Bacon or Ham – Sauté about 3 ounces of ham or bacon, then cook the onions in the rendered fat and toss with the cooked spaetzle. 1. In the small bowl, whisk together the flour, nutmeg, salt and pepper. Beat eggs in the medium bowl, and alternately add the milk and flour, stirring until smooth. Let the batter stand for 30 minutes. 2. While the batter rests, melt the butter in the large skillet over medium-high heat until it starts to brown. Add the onion and cook until it begins to caramelize, about 10 to 15 minutes. 3. Bring the 4-quart pot of lightly salted water to a boil. Press the batter through a spaetzle press into the water. When the spaetzle has floated to the top of the water, remove it to a bowl, draining well. Mix in 1 cup of the cheese. Add the cooked spaetzle to the butter and onions and stir well. Add the remaining cheese, stir, and serve hot. Beautiful story, and happy anniversary! Happy Anniversary, Andrea! Sounds wonderful – I will have to try this recipe = my husband and I both love spaetzel. I cooked some dried spaetzel the other day, to serve with bratwurst, but I bet it doesn’t compare to fresh. What a great story! Happy Anniversary and thank you for the very tasty looking recipe! It’s hard to eat granola for breakfast when you’re looking at spaetzel with onions and cheese. What a great post. I could almost imagine being there with you. Your husband is a very lucky man. Happy Anniversary! I don’t know about Michael, but these ten years have been very good to you, Andrea, you look just the same! Happy Anniversary! That is such a sweet story! Your tour guide cracks me up. I went to Oktoberfest when I was 20 for two days (and I am a wee 5-foot tall gal) and had an amazing time. Never once was I scared of dying! Tehe. In fact, I met some fun people there who I kept in touch with. This is a recipe I’ve been dying to make dairy-free (non-cheesy of course). Still on the to-do list. Oh spaetzle… I loved eating them when I studied abroad in Austria and I don’t think I’ve had them since. 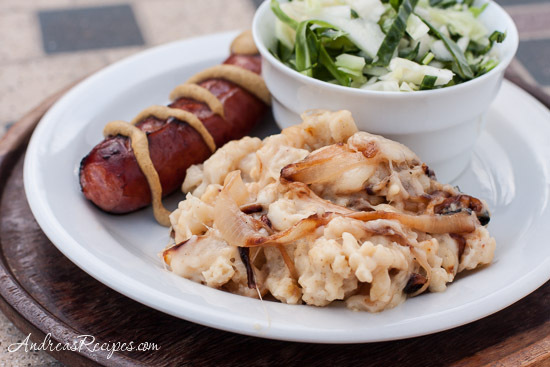 Since kaese spaetzle were my favorite I’m going to have to give this a try soon! A+. I just finished eating them.